Former City Councilman Jim Kenney has won the Democratic nomination for Mayor in a landslide victory over a field of 6 candidates. State Senator Anthony Hardy Williams came in second with former District Attorney Lynne Abraham in a distant third. Nelson Diaz, Doug Oliver, and Milton Street rounded out the field. 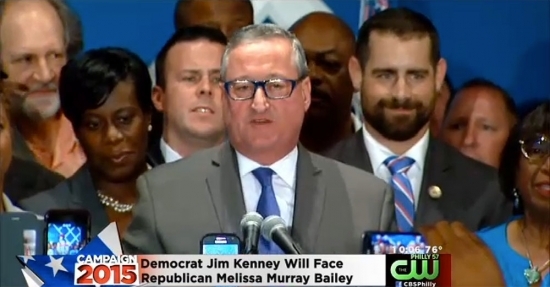 Kenney garnered roughly 56% of the vote, Williams 24% and Abraham 9%. Democrats outnumber Republicans in Philadelphia by an 8-1 margin, making this primary victory almost a pass to the mayor's office for Kenney. He will face Republican Melissa Murray Bailey in November. Philadelphians had four ballot questions to answer at the polls. They dealt with abolishing the School Reform Commission, creating a Commission for Women, improving access to city services for those with limited English proficiency, and establishing a Commission for Universal Pre-Kindergarten. All questions were answered "yes" by a 3-1 margin.